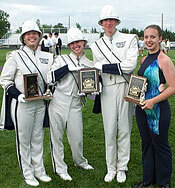 Founded in 1985, the annual Vikingland Band Festival is a highlight of the summer parade marching season. In the past 34 years the event has drawn 93 different bands from seven states, three Canadian provinces and Norway. SCORES - Browse the results from all past festivals. Eight different bands have earned the title of Grand Champion: Long Prairie, Henry Sibley, Litchfield, Irondale, Park Center, Mankato Lancers, Waconia and 728 Cadets. PHOTO GALLERIES - Each year since 1997 we've assembled a gallery of images that captured the winning performances and the spirit of the day. The earliest galleries were created with screenshots from the television broadcast. Recent galleries have been created with digital photographs taken along the parade route. GRAND MARSHALS - View a list of the men and women who have been honored for their contributions to youth, music and the community. HONOR UNITS - The tradition of including non-competing units in the parade was started in 1989 as a way to showcase a variety of marching styles. Styles represented have included foreign bands, military bands, bagpipes, drum and bugle corps and percussion lines. PARTICIPANTS - View this master list of every band that has participated in the event, along with their years of participation. Participants have come from seven different states (Minnesota, Wisconsin, Iowa, Colorado, South Carolina, South Dakota, Michigan), three Canadian provinces (Alberta, Manitoba, Saskatchewan) and Norway (five times). DRUM CORPS CLASSIC - A wonderful addition to the excitement of band festival weekend was the Vikingland Drum Corps Classic which featured nationally ranked drum and bugle corps in field show competition. Groups such as the Madison Scouts, Phantom Regiment, Cavaliers, Troopers, Glassmen, Minnesota Brass and many others drew standing ovations year after year. The event was held in Alexandria from 1991-2003 but was discontinued when Drum Corps Midwest and Drum Corps International changed the way they scheduled the summer tour. It became nearly impossible logistically and financially to obtain the top-ranked corps that the event had traditionally included. The event's website remains online and includes photographs, scores and a list of the 30 different corps that performed during the Classic's 13-year history. In 2016 a new field event began making history in Alexandria: the Minnesota Drum Corps Premiere featured the season debut of Minnesota's three all-age corps plus three special guest bands from Calgary, Alberta. Copyright © 1996-2019 Ken Martinson/ChoreoGraphics. All rights reserved.